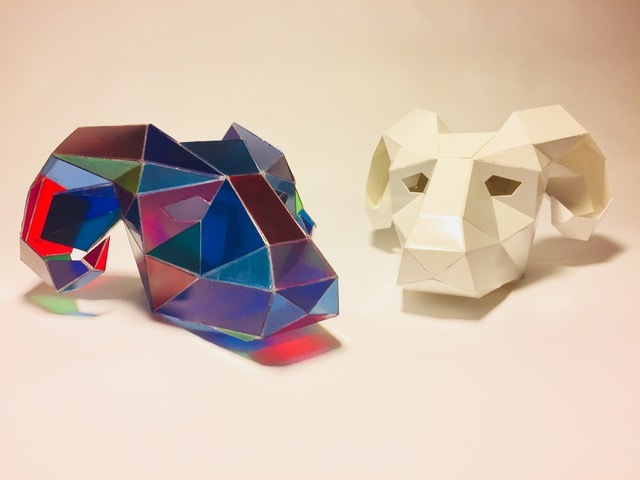 The masks where fabricated in 2mm Polycarbonate sheet and 2mm white styrene. Translucent vinyls where then adhered to the clear polycarbonate geometric shapes that make up the net shape of the Rams head. Each shape was cut out by hand and folded into the correct angles to produce a wearable Costume head piece. The masks where then sprayed with a primer and clear laquer. Each mask took approximately 10 days to produce. Wintercroft design Ltd design recycled paper wearable masks for online sale where people can down load a net shape and make their own masks in paper or card used for fancy dress and costumes. Phildel purchased the Rams head mask template from Wintercroft design Ltd who gave Creativefabrications consent to produce the costume head pieces in a more durable material with a view to using the masks in her album launch of ‘The Deep’ in 2019. The white mask is featured in her electric heights video that can be viewed here. The White mask is featured in Phildel’s Electric heights video. Phildel commissioned creativefabrications to produce 3 floating flag stage props used on stage for her performance at the southbank centre in March 2019, featuring the image taken from Phildel’s album cover the Deep. The image is inspired from a section of the stained glass look rams head mask. To create the flags Creative fabrications used a process called ‘heat transfer printing’. Where ythe image is produced in illustrator, printed onto heat transfer paper and then applied through a heat press and transferred straight onto the fabric. The flags were printed onto 2 meter x 1 meter lengths of polyester fabric. Each mild steel stand was designed and fabricated in mild steel with a 5mm base plate and captive nut mechanism to allow the flags to be dismantled for ease of transport on tour. The stands are painted using an acid etch ati rust black paint. The flags stand 2.4 meters tall and flow beautifully using stage fans.